First the disclaimer: this is not about the scratches on my piano, prominent as they are. I’ll add a picture to this post when I’m home, so you’ll know what I’m talking about. I don’t know where they came from, I wish they weren’t there, and let’s move on. Now comes the definition: “scratch piano” is a term I invented to describe what I do at the keyboard. I make big music out of small pieces. Sometimes what I have is a lead sheet, a musical skeleton with a melody and chord symbols (and, if there are any, lyrics). From that, I create my own arrangement of a piece, whether it’s a jazz standard, a Christmas carol, a gospel hymn, a folk song, a symphonic fragment, or something really esoteric. If this was the extent of what I do, I’d use the common term for it: faking. In fact, large collections of lead sheets are called “fake books,” and I have a huge library of them, enabling me to play gigs that call for music from many genres. But I do more than that. I can also take fully-composed and arranged music—hymns, arrangements of popular songs that lack chord symbols, classical works—and generate my own versions of them, drawing out those elements I want, creating my own arrangement in real time. Much of what I did as a church keyboardist was this kind of thing, since my piano sight-reading skills are competent at best. I recently played a two-hour gig of ragtime music, and much of what I played was improvisations on the themes of Scott Joplin songs, drawn from a sheet music collection. That’s still a kind of faking, though: playing a melody and making up a chordal accompaniment. The difference from regular faking is that I’m analyzing the chords myself, since there are no handy symbols attached to the music. What makes me a scratch pianist is what I do when I don’t have any music in front of me at all: improvising to a suggestion. I didn’t invent this kind of playing. Far from it: there’s a scene in Amadeus in which Mozart improvises a series of variations on a theme in the style of several different composers, each offered up to him on the spot. Many of the great composers of the 1700s and 1800s were known for their keyboard improvisations, some of which they transcribed and published as fantasias. 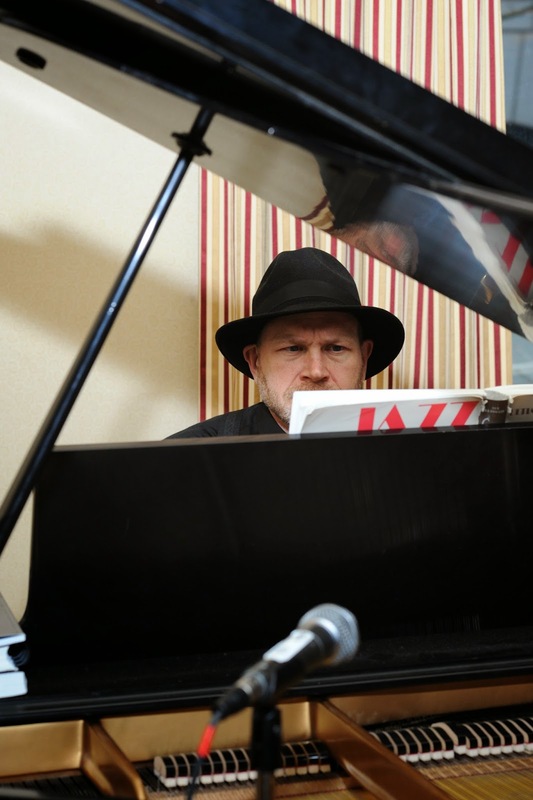 More recently, and locally, I’ve seen Knute Snortum create original improvisations that include silent physical performers in a show called Concerto for Piano and Mime. All the keyboardist has to work with is a title, revealed to him just seconds before he begins playing. The title consists of a noun and a verb drawn from lists solicited by a third person and never revealed to either the musician or the mimes. Ideally what results is a three-way improvisation, with the performers playing off each other both musically and physically, the music making offers to the mimes, and taking inspiration from their movements, as well. It’s like magic to watch, but in fact, it’s simple virtuosity. “Simple,” of course, doesn’t begin to do this justice. I’ve been improvising at the piano since I was a baby, though my initial creations were, like any infant’s, nothing more than random cluster chords. I remember a moment when I was five, and had not yet begun piano lessons, when it first occurred to me to tell a story with the piano, creating the sounds of thunder, a villain, a princess, and a rescuing hero. “Thank you very much,” sang the princess at the end of the drama in the top octave of the piano. “You are very welcome,” sang the hero in a much lower register. Taking piano lessons brought the improvisation to an abrupt halt. Learning piano, my mother was convinced, was all about literacy: reading the notes on the page and performing them perfectly at the keyboard. It was ten years before I began, once again, to experiment with learning songs from lead sheets and by ear, and to create my own music at the piano. It took me another twenty years to become really comfortable with playing entirely from lead sheets. As I did, I continued to create my own music from scratch, experimenting with melodies and harmonies to arrive at music that was pleasing to my ears. What finally freed me up to create at will was leaving the ministry and working as a church musician, rather than a preacher. Suddenly I was responsible for hymns, preludes, offertories, underscoring prayers and sermons, creating a mood for the service. Much of what I played was improvisations on hymns, but as time passed and I became more comfortable, I began making up my own music. Enter ComedySportz, and the world of musical improv. For CSz’s short form games, I’m called upon to prompt improvisers to sing original songs, to underscore scene games, and, when I’m really lucky, to invent an opera or rock opera. It’s tremendously exciting, putting me in the Zone of absolute focus, my ears in full accord with my fingers and eyes, utterly present in the game being played on stage, finding the right moment to begin a song, coaxing the singer toward a chorus, a bridge, a coda. To the audience, it’s magic; to me, it’s tennis, chess, writing a novel, flying a jet plane. When it’s over, I often can’t tell you exactly what I did, other than to evaluate whether it worked or not. It may seem odd to think of a short-form improv show as the culmination of my musical career, but in many ways, I feel as if this playing is what my entire life at the piano has prepared me for. That’s why I feel so honored to occasionally be called on to sit in at the keyboard for Knute. Concerto is his bag, and he does it brilliantly. Getting to do it myself is like Leonard Bernstein’s big break, subbing at the last minute for Bruno Walter with the New York Philharmonic: I get to play with the big kids. But let’s step away from that, and get back to the “scratch” in “scratch piano.” This is where I see myself headed as a performer, though I realize there’s not much market for it: taking audience suggestions and turning them into complete compositions. The raw materials for this playing are in my head, my heart, my hands, in the words of the suggestion, and in what happens between me and the audience. It’s a musical tightrope walk, playing without a net, thrilling, pleasurable, dangerous, wonderful. At some point in that ragtime gig I mentioned earlier, I ran out of Joplin I could comfortably fake. I could've cycled back through that book; this was a party, and with people buzzing around and having loud conversations, I don't think any were paying enough attention to have noticed a rerun. But I hate repeating myself, so instead, I channeled the harmonies and rhythms I'd already been playing for an hour into something new, and began improvising in ragtime. That's the point at which the "scratch" really takes off: making up something utterly new, on the spot. When I do this, I have to turn off my cognitive centers and let my subconscious run the show. I become almost a passive observer, feeling my way through whatever my fingers are knitting together from all the threads of music floating around in deep storage. The result can leave me breathless, astonished--or befuddled. Sometimes I make something transcendent. Other times I don't. The reason my scratch piano playing can still be hit and miss, despite my years of experience, is that it's improv. Even the best improvisers have off shows. It's the nature of the beast. The more you do it, the less likely you are to stumble, but there's always a chance that you will, anyway. Hit or miss though it may be, it's still what I love best about the piano. And I'd love to share it with you. If you're curious about what it means to be a "scratch pianist," sit me down at a keyboard, give me a noun and an adjective, and I'll be happy to show you. So for all of you who’ve wondered what I mean when I say I’m a “scratch pianist”: give me a noun and an adjective, and I’ll show you.